Danny Fell‘s Richmond, VA office strives to make a difference through creativity that inspires, that changes behavior, that changes the world. From the front door visitors are greeted with a “We are ndp” sign. Bob Fox: I want to understand a little about why your organization is unique. How is this reflected in your space and how are you using your space to achieve your business goals? Danny Fell: ndp agency has been around for a little over 30 years. We’re a marketing and advertising agency, but are heavily focused on the digital side, so I would say we’re more of a digital-forward advertising agency. We were founded in Richmond, Virginia in the early 80s by a few individuals who previously worked in the healthcare industry and were looking to start a healthcare marketing consultancy firm. During the agency’s early days, it was almost exclusively focused on healthcare marketing. We grew over the years to specialize in the healthcare industry and it has allowed us to do a lot of national work that we happily continue to do today. The company also grew over the years through a series of acquisitions. Our headquarters is still in Richmond, but we currently have two other offices in Virginia and Tennessee. We do full service marketing, advertising, and communications for organizations, for profit and not-for-profit companies and brands. Our team executes design, the digital media buying and planning operations, strategic public relations, research, and market research for our clients. We provide a full suite of marketing and communication services. Healthcare is still our largest sector – it’s about 70 percent of our work and we’ve diversified beyond hospitals into life sciences, medical technology, health technology, and health information. The rest of our work is in sectors such as hospitality, banking, and manufacturing. The agency has about 65 employees now, and one of the reasons why I point out our acquisitions and our multiple offices is because culture is a real challenge for us. With our remote workforce, this is one of the factors that we struggle with, like a lot of companies with multiple locations or remote staff. Bob Fox: How would you describe your culture? Our real strength is in inspiring and changing behavior among consumers, stakeholders, and target audiences that our clients seek to speak to. Our culture is fairly laid back but we come from a more research centered, data-focused, strategic background. We’re not a creative boutique in the true sense, we’re a little more of a blend between a consultancy and creative agency. The commitment to creativity is painted on one of the walls. Bob Fox: How is your space reinforcing a creative culture? Are there any physical elements capturing the essence of that? The space we were previously in for many years was not an ideal space for a couple of reasons. We came from a space that was three old buildings connected together. It had a house type-feel with people on different floors, different elevations, closed offices, and low ceilings. The space we’re in now has been truly transformational for us as it’s very open, well lit, with very few private offices and any offices that do exist have glass walls. In contrast to where we came from, it was like night and day. That was by choice, and by design. There were a couple of things about the space that we intentionally sought in designing it. We are in a 15,000-square-foot, one-story warehouse and we wanted to keep as much openness as possible with very few partitions, no large tables to make people work at, and a lot of light. We also built a very large work cafe that doubles as an eating, working, and gathering space. Throughout the day it becomes a large open area for people to grab coffee, a snack, and work there as well. With our remote workforce, a lot of us come and go, so our work cafe has become a popular feature of the space. One of several conference rooms named after geological features in Virginia. We also designed a lot of options into our meeting spaces with two very large presentation rooms, a set of smaller war rooms or gathering rooms that seat anywhere from four to eight people, all the way down to the private phone booth” spaces. One of the things we learned from visiting other companies is that the variety of meeting spaces and personal spaces is essential. We also noticed that in the companies that have living room style areas, they were not being utilized, so we intentionally created seating areas in the main entryway but downplayed the living room atmosphere. We leaned more toward a working type atmosphere with bar height tables and plug-ins for our employees to work at. Some of the other features we built into the space are a lot of flexible items such as moving whiteboards, dry-erase walls, and portable boards to allow for more collaborative thinking. Bob Fox: Are there any elements or aspects of the space that’s unique to ndp that captures who you are and what you do? We’ve had long discussions about whether we wanted to have monitors on the wall or walls with flat screen TVs, but we actually went the opposite route. We’ve intentionally downplayed the technology a little in the space and make it more minimalist. The space has less artwork on the walls to create a distraction-free look. Without a lot of video, multimedia, and animation, our employees are able to have true human interactions in our space. In conference rooms we have video capability, but we opted to encourage more face-to-face interaction. That was the idea behind our cafe too – so that there was more personal interaction and a sense of togetherness. The workplace café – a place to work, eat or have meetings. One of things about being so digital and technology-driven, is that often times we, as an industry, are getting sucked into thinking about consumers as being data points, analytics, and numbers. This differs from the human aspect of how we communicate, so we worked to have our space emphasize human interaction more. We felt like the spectrum needed to be pulled back more into the human side. Bob Fox: Was there an overarching goal for the design of the space or something that drove the design? We rebranded three years ago, and if you look at our website or business cards you’ll see what we refer to as ‘the doodle’ or a ball of string. The whole thought process behind that was that creativity in its true raw essence is sometimes a little chaotic. It isn’t linear like accounting or engineering, it’s a little bit of a winding road and a process that you go through when creating anything in the broadest sense. The idea behind the doodle was that creativity is not a linear path, and it’s out of that chaos and winding path that clarity and insights and solutions emerge. This was also the motivation for the design of our space. We wanted to capture that, not with a chaotic space, but with that open minimal space where creativity can take place. Architecturally, we were also limited in the things we could and could not do since it’s a historic space, so a lot of the elements needed to remain as is. We tried to build onto what was there to suit our needs for instance, with a big cinder block wall down the middle of the office. We built onto that so it felt natural and seamless. Our desks are clustered in work areas, but we also try to avoid having a hard line between department labels, so the space is overlapping a bit. The creative and the accounting people are generally in the same space and billing and media people work near administration. We didn’t want people cut off from other people. It’s a very open, and random space in that respect. One thing we do have, is a gigantic six-foot grape vine ball that sits in our lobby as you walk in and, unless you really thought about it, you wouldn’t tie it to our logo, but it is a 3-D art feature within our space that ties back to our brand. Bob Fox: What do you think is the biggest value that you’re getting out of your workspace? 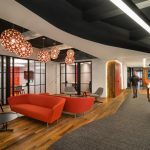 It was a huge contrast to the space that we had been in, so for our staff it is more collaborative, open, more naturally lit, and it gives them a sense of being a part of something. Everybody feels like they are part of and contributing to a greater whole. A big focus on the collaboration for us is spending time together and having a space that doesn’t feel traditional was very important for us. Bob Fox: When your visitors come into the space, what do you think they’re going to take away from the space? If you know a little bit of the history of the Richmond neighborhood that we’re in – Scott’s Addition – it was primarily manufacturing so there’s a lot of one- and two-story buildings but nothing that architecturally catches the eye. When you come into our space, you feel like you’re in a different dimension. There’s definitely a contrast between a neighborhood that’s growing and vibrant but somewhat nondescript architecturally. When you come in our space, there’s a real sense of design, creativity, openness and flow. It feels very comfortable and protective. We want to convey trust and instill that in our clients. For people coming into our space, conveying that feeling is very important to us. Bob Fox: Where are you most willing to spend money or make an investment on your space that you think you’ll make the biggest return from? The work cafe may be one of the areas we want to continue making an even more flexible space where we can open it up to community groups and specific groups. We’ve done a number of community events in the space and we would love to do more in the future. I think it’s important to invest in the community around us. When the company started, a lot of our focus was all around the country, and we did not have as many local clients as we do now. We want our team members to feel a continuity between living within a community and working in it as well. It’s challenging when you have a business and co-workers that are spread around the country. It adds to a disconnect, so we wanted our home office to feel more part of the neighborhood and welcoming when people come visit. Bob Fox: You have a great quote on your website under the design of what you do that states, “great design is simply the place where beauty, function, and cool collide”, and it seems as though your space embodies that idea. As a creative agency, design is very important in all aspects of what we do. We even talk about “design thinking” in our processes. I think there’s always that sense that what we do is constantly evolving and changing. We were very intentional in not creating a space that was too locked into a particular look and feel or restricted the work we did in it. We really wanted it to be more of a blank canvas so that the people within the space create the tone of the space. Bob Fox: Is there any way you measure how your space is being used or the performance relative to your space? We moved in January 2018, so we’ve been here for only a year. We get a lot of great feedback from our staff, clients, communities and partners but in terms of metrics, that’s a little harder to put our finger on at this point. I would say that the overall satisfaction with the space from our team is definitely higher, but it would be tough to measure quantitatively at this point. Bob Fox: If you look out to the future, how do you see your space changing? Do you see any change in the way that you work in your space? As we move a little further along the trajectory of being an agency that also makes things, I could see us building things like small workshops and lab spaces. We could take a more hands-on approach in building products one day like a lot of creative companies are doing now. A view of the café with inspiration wall in background. Bob Fox: Anything else we left out? Having gone through the experience with other office spaces, one of the things that did make a huge difference was working with an outside design firm. Hickok Cole did a terrific job and really spent time getting to know our team and how we work as well soliciting input and conducting lots of brainstorming sessions about the ideal workspace. Ironically, as we were finishing up the space and getting ready to open, there were a number of national news stories on “why open spaces don’t work” and how the pendulum was swinging back to closed spaces. But I think what companies, like us, are finding is that balance is what is most important. I think most of our employees would say we achieved a good balance within our new space. It’s very open, but you can also find those quiet and private areas if you need to concentrate. All images are courtesy of ndp agency.